Used Flexible Conveyor s a powerless free flowing conveyor system for transporting products throughout the warehouse. They can be set up at a decline and at different angles and bends to have products flow automatically from an area of high elevation to low elevation. They can also be set up horizontally for products to be manually pushed, which is ideal for areas where products need to be manipulated manually. 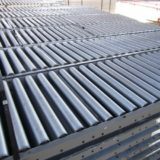 Flexible conveyor is used with power conveyor to make a complete conveyor system.